Exactly like physical health, mental health pain is more about the level of distress it’s causing us than the injury itself. The reason we treat pain isn’t because it hurts. It’s because it’s distressing to us. The brain doesn’t differentiate between physical pain and mental pain. In fact, this is a big reason why they try to get chronic pain patients to tackle existing mental health problems (whether they’re caused by the chronic health conditions or not). Central nervous system sensitisation can make us more sensitive to perceiving pain. Right now, we believe that chronic, severe pain doesn’t actually make us more tolerant to pain. It makes us less tolerant, and oversensitive to it. You can imagine how well that goes down with chronic pain patients. It makes sense, though. If every day you burn your hand on the stove, you start flinching before you reach it. Your brain tells you ‘this is hurting already’. Any reminders of that heat or stove will prompt the pain-aversion response, and in the cases of most chronic pain (old injuries), that’s not actually warranted anymore. That same exact part of the brain is what deals with mental health distress too. It’s why PTSD and chronic pain are such a crappy combination (trust me, I know). So, a better mental health pain scale. Why do we need one? If you’ve ever experienced mental health issues, or closely supported a loved one who has, you’ll remember all the questions to try and work out just how screwed up you’re feeling right now. Initially those are forms like the K10 Psychological Distress Scale, plus a bunch of others that apply to more specific conditions. But can we come up with an easier way of telling our treatment teams and loved ones how we’re doing today? This quick visual scale was doing the rounds on social media a couple of weeks ago. It’s a good way to let people know what’s been going on for us, and whether we have any immediate needs. While it’s definitely better than nothing, it requires the other person to have a copy (or at least know that ‘red is probably a bad colour’). Pain scales, on the other hand, are almost universally understood. Even if you don’t have a super specific idea of what the person believes is an 8 out of 10, everyone would know that an 8 is a serious situation. The real problem with pain scales, in my experience, is that we don’t know where to put ourselves. It’s not that other people don’t understand what a 7 is, it’s that we don’t know how seriously to rate our pain. We have people overestimating their pain because they believe they’ll be taken more seriously (and self-sabotaging in the process), and we have people underestimating their pain because they either don’t want to be seen as a ‘wimp’ or a ‘troublemaker’, or they just don’t understand how the pain scale is meant to work when they’re the one experiencing it. So can we make a better short-hand mental health pain scale? I think we can. Let me go into this by saying that despite my decade of volunteering in youth mental health and suicide prevention, I am not a mental health professional or a doctor. I have been a young person with lived experience of mental illness, I have cared for loved ones with mental illness, and I have helped others with their mental illness in both paid and unpaid roles. I am not a professional, just someone looking for an easier way to communicate pain distress to others. How I classify distress may be different to the ways other people both experience and perceive it, and it’s not a replacement for what the professionals have to offer on the subject. 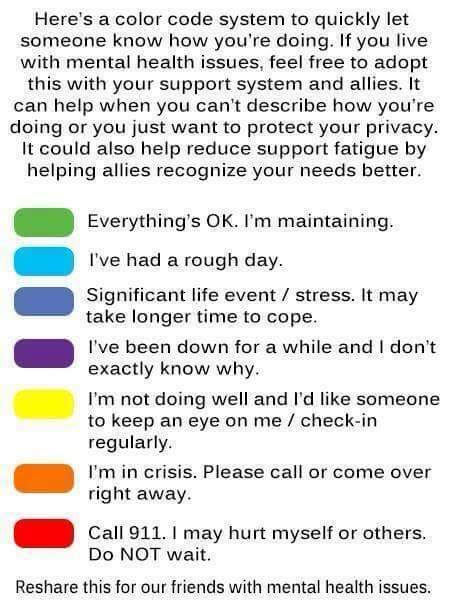 Just consider this another possible option in your toolkit for communication when things are difficult for you or the people you support. 1 is totally fine. Much like my feelings on the physical pain scale, I’m not sure anyone really feels like a 1 for very long, if at all. Maybe when they’re surrounded by kittens and someone else has just made them a perfect cup of tea. 2 is the smallest amount of ‘something isn’t right’. You might be frustrated that your partner threw their socks next to the laundry hamper rather than in it (again). It’s the groan when another register opens at the supermarket, and you’re in the exact wrong spot in your current queue (too close to the front to dash over and get served more quickly, but far enough back that you’re going to silently judge what other customers are buying while you wait). 3 is a slight amount of distress – the mental health equivalent of a headache. You have the tools to cope with how you feel, but it’s not pleasant. Your distress isn’t impacting on your life in a meaningful way yet, but you know that if it gets much worse, you may start to struggle. 4 is just a really bloody bad day. Even though you’re still coping with your pain, you may not be able to hide that from others as easily anymore. At a 4, this is starting to impact on your normal daily living, but not across the board. Maybe you’re not sleeping very well, or you’re getting anxious and it’s harder to deal with social situations. This is a great time to exercise your self-care. Take some time out for you, because it’s much harder to cope with things if we’re running on empty. Pick up a book, watch Netflix with a friend, have a shower with your music turned up loud. Be kind to yourself. At 5, distress is starting to become more evident. If you’re prone to mania or intrusive thoughts, you might find that it’s getting much harder for you to do the things you usually do, the way you usually do them. Your mental health is really starting to impact on your normal life. When I’m a 5, I start avoiding friends because I don’t want to deal with the hassle of socialisation and the ways that affects my mental health. If you haven’t already reached out to a mental health professional (counsellor, psychologist, psychiatrist, or even just your local doctor), now is probably a good time to do it. Early intervention is best intervention. 6 is getting pretty serious. I know it’s just over halfway, but remember that totally healthy, happy people are a 1. You’re not halfway between ‘happy and unhappy’, you’re halfway to ‘this is as bad as I can possibly imagine’. Don’t underestimate the pain you’re in. By 6, your mental health is really getting in the way of your normal life. You’re starting to have significant trouble doing the things you usually do (sleeping, socialising, thinking, eating, exercising, working or studying, and doing stuff you enjoy). Depending on your specific problems, this might just be a simple ‘these things are hard’, or it might be ‘I can’t do them the way I used to do them’ (like if you have OCD, mania, or other problems with impulse or compulsiveness). If you haven’t spoken to a mental health professional by now, you need to. Now is also a good time to make sure you have a support person who can advocate on your behalf if you struggle to communicate your needs. Remember that a 6 on the physical pain scale means that it’s hard to talk outside your pain (like contractions in labour). If you do become more unwell, it can be very difficult to advocate for the care you need. At 7, you’re reinforcing your distress because of the way you’re coping with it. This is where things like depression are really, really hard to manage without some kind of intervention. Socialising causes you distress, so you avoid it, and that just reinforces the entire pattern. Insomnia stresses you out, which releases stress hormones and makes it harder to sleep. You don’t have an appetite so you eat less, and that makes you less hungry. You need someone else to step in to help you. I know it often doesn’t feel as serious as this when you’re experiencing it, but to a healthy person, this is really concerning if it’s affecting multiple areas of your life. Healthy people don’t feel this way. Not for extended periods, not across multiple parts of their daily life. You’re unwell, and you need help. 8 is serious distress. On the physical pain scale, you can’t function with the sort of pain you’re in here. It’s not much different with mental health. You’re avoiding normal daily living tasks because they’re too hard. Your behaviour and personality have changed in ways it’s impossible for those around you to ignore. You’ve run out of the ability to cope with things, and this is probably starting to come out in some ways that are pretty dangerous for you. Impulsive and compulsive behaviours, considering or actual harm to yourself, not taking care of your basic needs (hygiene, nutrition, etc). If this was physical pain, we’d be cranking up the morphine and trying to fix the problem. Your mental health supports need to be doing the same. Make sure your advocate understands your distress. 9 is critical. Don’t be afraid to use your 9. Don’t wait until 10 to say ‘this is the worst I’ve ever felt’. Don’t wait until you can’t imagine things getting any worse. Use your 9 now if it’s necessary. It’s important for us to remember that the peak distress point isn’t always suicide. While that is absolutely an issue that should be treated with most importance (you can’t treat a dead person), it’s possible for someone to completely neglect all areas of their health and still not be suicidal. Those people should still be treated seriously. Don’t discount yourself or a loved one just because they aren’t actively suicidal. At a 9, all or most major daily life functions are seriously affected – sleep, appetite, hygiene, socialisation, work/study, exercise, leisure. At a 9, someone is existing, not living. 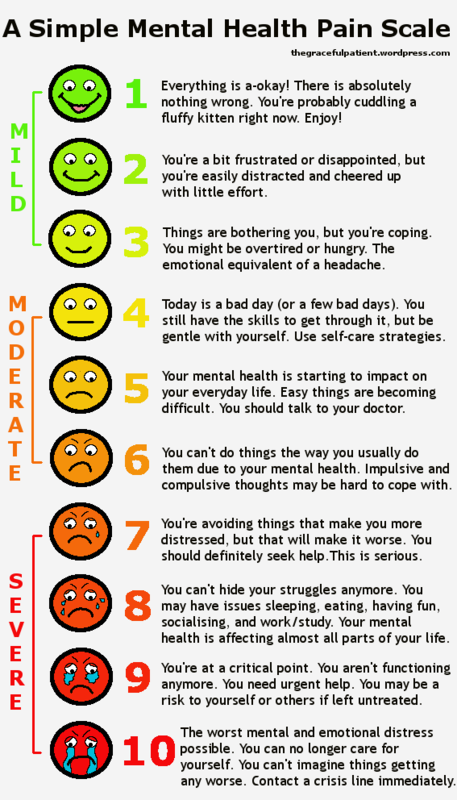 10 is the worst you can imagine your distress to be. Like with the physical pain scale, if something else could make you feel worse (like losing a loved one), then you’re a 9. If you honestly couldn’t tell if anything else terrible happened in your life, this is your 10. For most people this is actively planning a suicide attempt, but it doesn’t necessarily have to be. Curling up in your bedroom and no longer attending to any of your body’s needs can still be a 10. Planning to hurt others can be a 10. Having no attachment to reality anymore can be a 10. There are lots of ways mental health and mental distress can be experienced, and this is not just a suicide scale. This isn’t a definitive guide to mental health. You know yourself better than anyone else does. If you have a history of rapid decline, seek help earlier. If you know your history of therapy and full toolkit of coping skills means your ‘4’ is someone else’s ‘8’, communicate that to those involved in your care. The pain scale is only as good as we’re able to explain it to other people – whether that’s mental health or physical. I’ve thrown together a short version of this in an image form, just to make it easier to spot, use, and communicate. Feel free to use and share away if you feel this might be useful for you. The better we’re able to communicate with our treating teams and loved ones, the more likely we are to be supported in a way that’s useful to us.